Either 18650 or 26650 batteries are hot topics in the vaping and tactical flashlights world. 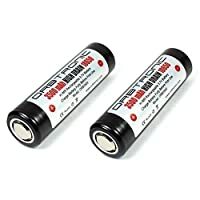 If you’re a vaper or a flashaholic, you probably have encountered these two types of batteries that you must not miss having in your arsenal. They directly affect the runtime and amount of power available for use. While they have plenty of advantages, they can also be a source of danger – and explosion when put under stress or overcharged or perhaps improper use. 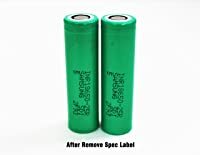 That’s why before going online and finding your vape or torch battery pack, be aware of certain terms and compare the batteries based on your intended purpose. For example, will you be using the 18650 for sub-ohming, or vaping through an atomizer, which has coils for vape having a resistance value of fewer than 1.0 ohms? Or will you use the 26650 or 18650 for torches? Before looking into the best models on the market, you must learn about certain often confusing terms you’d read on the label. Let us guide you below. In batteries, it refers to milliamp hour, measuring the unit’s electrical power over a certain period of time. This term is also used to refer to a battery’s total energy amount that it can store at a certain time. Referring to mAh when buying, you could tell the battery’s capacity or strength because the higher its rating – means the battery will perform longer. “Capacity” or C rating refers to the max and safe continuous discharge rate of your battery. So if you find 10C, your battery can be discharged at 10X that specific pack’s capacity. C rating also helps you determine how much the battery can safely be charged. You will find the C rating together with the mAh rating. And then the result is the power capacity of the unit can supply you in an hour. For example, a 5200mAh rated at 2C can be pushed up to 10,400mAh or at 10.4A. As mentioned, it’s the ampere-hour, or Ah – sometimes also called the amp hour. It simply describes the energy amount in your battery. That energy will let one current ampere to flow for 60 minutes. What’s an ampere? It is the unit measuring the electron flow’s rate or the current present in a specific electrical conductor. For example, a battery with 1000 mAh means that it can provide 100 milliamps for 10 hours. Conversely, one with 2000 mAh can provide a current volume for up to 20 hours. Without even saying, the higher the mAh the longer the battery would run. In most cases, the 18650 and 26650 are lithium-ion batteries. They usually possess the same mAh rating with that of nickel metal hydride and nickel cadmium batteries. What is 3.7V in these cells? Most battery manufacturers use 3.7V, which is its nominal cell voltage. Such has a 2.8–3.0V typical end of discharge and a max discharge voltage of 4.2V. On the market, almost all lithium polymer units are running with 3.7V or 4.2V. Voltage describes the differences regarding the electrical potential between “the positive” and “the negative” terminals in a cell. A greater or higher voltage is the greater difference in the potential result. What is protected and unprotected? These are two other words to find on the labels of batteries. For protected Li-Ion batteries, it means that they have a small electronic circuit, which is integrated into the packaging of the cell. This small circuit is able to protect the units from dangers, such as overcharging, temperature and under- or over- current. Protected units are safer for your devices. Unprotected ones, on the other hand, do not contain this small circuit in their cell packaging. Thus, the batteries can have more current capability and capacity than the type discussed earlier. They are prone to suffering from the dangers, such as short-circuiting, overheating and overcharging. Both the batteries can be used to power almost all types of devices that need a battery of their size. But because of different specifications in your devices and the batteries themselves, you must find which one to use for your specific needs and purposes. For example, 18650s can be used alone or with other batteries to build power banks and battery packs. These are used in recharging a device. In many cases, 18650s can also be used directly, and they can also be replaced and removed as well as recharged. 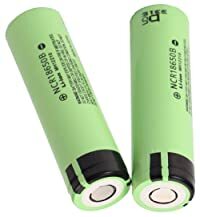 Torches/flashlights and vaping devices also use these two battery types. Either the size is an 18 x 65 or a 26 x 65 depends on the size required by a specific device, say a flashlight. It is simply how many amps can be pushed into the batteries safely. Let’s now talk about watt-hour. What is it? WH can help you approximate the runtime for regulated devices that have constant amps. For instance, drawing 20 watts from your battery that is able to put out 10 WH can provide you with almost 30 minutes of uninterrupted vape time. This is a fast lithium battery that has a 3.7V and 3000mAh. It is a four-pack battery that has a superb capacity. In that case, you no longer have to stress about long lasting power and operation. 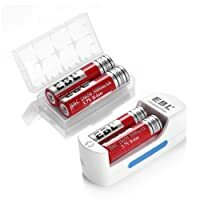 This EBL is a rechargeable type with 1000 cycle. It is made with a mix protection addition to its battery cathode, protecting its material from easy degradation due to charging and discharging. They have a lifespan of up to 1000 cycles. The manufacturer also ensured of its low self-discharge, maintaining 75% of its capacity even after a year of being stored and after being fully charged. 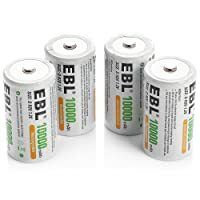 This EBL is also 0.1 volt higher than its competitors are when it is 100% charged, making it suitable for long time operation. This battery has a higher mAh rating at 3500mAh than the first. It is a high drain and rechargeable Li-Ion battery that has a flat top and includes a battery case. This pack is composed of two high power batteries. Its discharge rate is 18AMP and 10amp continuous. It is one of the most known in the 18650 category, as torch lovers choose it over others for its excellent performance and long battery life. The product has a maximum endurance power than can keep your device running for a longer time. It provides your torch with longer running time as well. However, it is an unprotected type of battery, so avoid short-circuiting it. The product measures 18mm x 65mm and weighs 48g. If you want a reliable battery for your device, then you may want to take a look at this model and brand that gives you maximum performance. EASTSHINE is one of the best manufacturers of 18650 batteries, as proven by its top user ratings. The E35 is a 10A and button top type of battery that can last longer than its competitors do. The battery has a 12.9wh rating, so it can run smoother and longer. It is also a protected type of battery, meaning it is protected from the dangers or overcharging and short-circuiting. The maker also ensures safety for its four sets of internal protection feature and three sets of external protection feature, meaning its safe use without any hassles. It also boasts its excellent performance that makes it perfect for high drain devices for its 3500mAh. 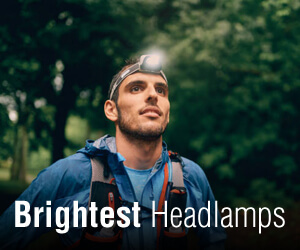 The E35 is perfect for flashlight, headlamp and other high drain devices. It measures 18.7 mm x 69.3mm (diameter x length) and weighs 50g. 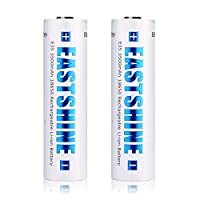 if you’re looking for a reliable 18650 battery for your high drain devices, then you may want to take a look and consider EASTSHINE 18650. This pack comes with two pieces of high capacity Li-Ion power cells, each having 2500mah and 20A discharge rate. It has a nominal discharge capacity of 2500mAh and comes with a nominal voltage of 3.6 volts. This INR18650-25R cell has much power behind it, making it ideal for any mod. They are tested even for high amp pulse discharges, so they can be used for sub-ohm vaping too. If you’re planning to keep your batteries for at least three months, you should keep it at a low temperature and dry environment. Samsung is a trusted technology giant known for manufacturing batteries and devices. The maker offers warranty on their products, but you must check on such specifications on what you’re buying. Overall, the product is a top performing one with a better cycle life than that of its competitors do. The MXJO 18650 is a reliable battery for vapers looking for sustained power and performance from their batteries. This model has a high rating on reviews, and many users have revealed of its excellence in performance. This is a high drain battery that works perfectly for vaping. Each pack is composed of two high power batteries. It has a 2500mah rating and a 35A capacity. The product has a nominal voltage of 3.7 volts and a continuous discharge current of 20A. Take note that it also has a maximum discharge current of 20A, while its maximum discharge current is 35A. Remember that it has an operating discharge temperature between -10 and 60 degrees Celsius. It measures 65 x 18.24mm (+/-0.05) mm. 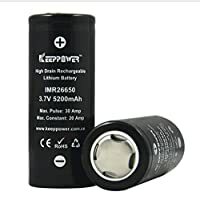 If you’re looking for maximum sustained power and performance of your vaping batteries, you may want to consider this one that is one of the top rated products in the category. The Panasonic NCR18650B is good for low and high current, based on tests. They are also rechargeable, meaning no need to buy disposable batteries from time to time. It also has a standard voltage rating of 3.7V and a high performing battery at 3400mAh. Based on tests, such batteries can also last twice as long as other models like the Sony VTC5, which is only rated at 2500 mAh. This battery can also last longer by up to four times than ordinary and cheap China-made batteries. It is also Lithium ion cell that is proven for its long life and high capacity. This model is also rechargeable by up to 1000 times, meaning you can use it for a long time. However, it has no PCB protected board. It can be used for electronic products and torches. It measures 6.5 x 1.8 x 1.8 and weighs 91 g.
The EBL 26650 batteries are perfect for powering your devices including digital cameras. They have a high rating of 5000mAh, meaning they can operate longer than lower rated mAh models out there. Each pack is composed of four pieces of high power and high drain batteries, which can perform excellently in supplying your devices with power for a longer time. They can also be used for vaping devices and flashlights requiring 26650 batteries. Each battery is rated at the standard 3.7 volts. Another top feature of these cells is that they are low self-discharge, meaning they can maintain 75% of their capacity even after three years of non-use. They also have a long cycle time and lifespan, allowing recharging for up to 1200 times, when they are drained partially or fully. This product also includes storage case; every pair is packed in a storage case. Versus competitors, this battery has a high discharge and recharge rate performance for high drain devices. Are you looking for a reliable battery for your high drain devices? Then, you may want to consider Keep Power, a well-known battery manufacturer that has a solid background in the industry. This pack includes two pieces of IMR 26650 batteries, each rated at 5200mAh for top performance and endurance. They are also rated at a standard of 3.7 volts maximum and have a 30A discharge rate. Each has a minimum capacity of 5100mAh at 0.2 C discharge rates. They only require a standard charging time of two hours and have a lifespan reaching up to 2000 times discharge and charge cycles. At maximum charge, they have a 6A rating, with 2.50V discharge end-off voltage. They’re excellent batteries that can be used for vaping devices, and users can expect long operation time before the next recharging. Overall, KeepPower is one of the best 26650 products we’ve reviewed so far. If you’re considering a high power cell for your high drain devices, then you may want to give this product a second look. 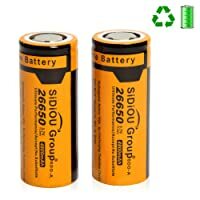 Rated at 4800mAh, this SIDIOU Group rechargeable battery is a high power cell for keeping your devices running smoothly for a longer time. Each pack is a set of two pieces of reliable batteries for your LED flashlight and other high drain devices. The product has a standard rating of 3.7 volts. They are made of high quality materials and integrated with protection for both discharging and recharging. This feature is important to ensure that your device will stay safe from overcharging, discharging and short-circuiting. Choose this battery if you’re looking for supreme protection for your head torches and other devices. This is ideal for hunters, explorers and campers, among other professionals for a backup rechargeable battery. It is also perfect for many types of torches, but they are not suitable for e-cigarettes. The bottom line when buying an 18650 or a 26650 battery is to first understand the most important terms – voltage, AMP rating, capacity, mAh and so on as we’ve discussed earlier. 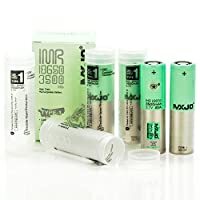 Only this way you can determine if you would be using the right type of battery – with the right capacity, amp rating and voltage, among others – that your device, such as a flashlight or a vaping device, really needs. Check on the maker instruction on your device and find out what specifications of a battery it requires for safe operation of your vaping device, digital camera, torch and other electronic devices. Once you have figured those out, choose from our featured 18650s and 26650s above for the best battery experience. Study, compare your options and keep your device safe today! Beside that, at my blog, we also have many articles to share you all things need to know about top rated 18650 flashlights, and the next topic is Flashlights that use 18650 batteries. Sponsors: Battery Charger – Minimax Charger Reviews | Does Minimax Charger Really Works? Battery – Mighty Max Battery Review 2018 – What battery is right for you ?